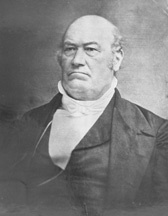 EWING, Thomas, (father of Thomas Ewing [1829-1896]), a Senator from Ohio; born near West Liberty, Ohio County, Va. (now West Virginia), December 28, 1789; moved to Ohio with his parents in 1792; pursued preparatory studies; graduated from Ohio University at Athens in 1816; studied law; admitted to the bar in 1816 and commenced practice in Lancaster, Ohio; elected as an Anti-Jacksonian to the United States Senate and served from March 4, 1831, to March 3, 1837; unsuccessful candidate for reelection in 1836; chairman, Committee on Public Lands (Twenty-fourth Congress); appointed Secretary of the Treasury by President William Henry Harrison and served from March 5 to September 13, 1841; appointed Secretary of the Interior by President Zachary Taylor 1849-1850; appointed as a Whig to the United States Senate to fill the vacancy caused by the resignation of Thomas Corwin and served from July 20, 1850, to March 3, 1851; unsuccessful candidate for election to the United States Senate in 1851; resumed the practice of law in Lancaster; delegate to the peace convention held in Washington, D.C., in 1861 in an effort to devise means to prevent the impending war; appointed Secretary of War by President Andrew Johnson in February 1868, but the Senate refused to confirm the appointment; died in Lancaster, Ohio, October 26, 1871; interment in St. Mary's Cemetery. Dictionary of American Biography; Miller, Paul. Thomas Ewing, Last of the Whigs. Ph.D. dissertation, Ohio State University, 1933; Zsoldos, Sylvia. Thomas Ewing, Sr., A Political Biography. Ph.D.dissertation, University of Delaware, 1933.